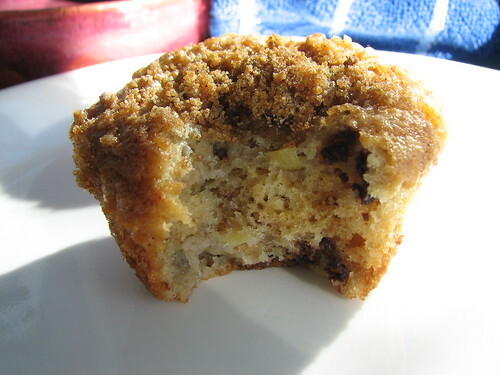 Recently I posted a recipe for chocolate chip banana muffins. I found a banana bread recipe from Martha Stewart while web surfing that was touted as being extra special, so I decided to give it a try because I had these bananas that were on their last legs. Here’s the recipe with the slight changes I made. Makes about 18 muffins. I added 1/2 c. mini chocolate chips. Sift the dry ingredients together and combine with butter mixture, mixing well. 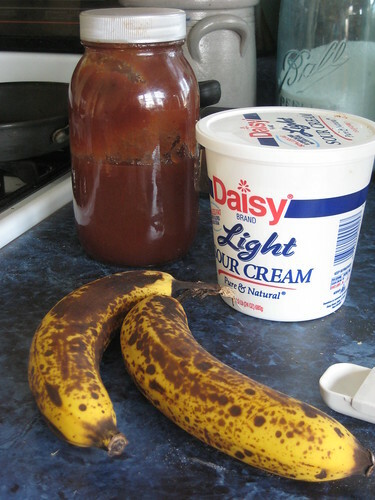 Mash the bananas, then add them, the sour cream, and vanilla and mix well. Stir in the nuts and/or mini chocolate chips. 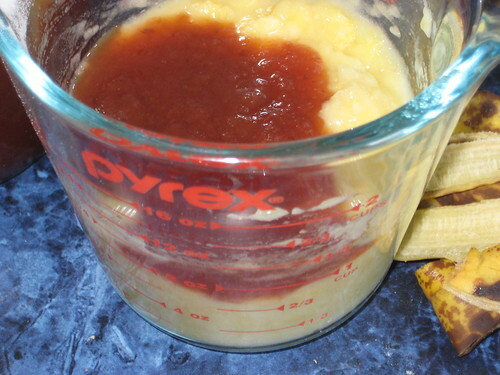 After mashing the bananas, I didn’t have quite the cup required, so I added some apple butter to make up the difference. 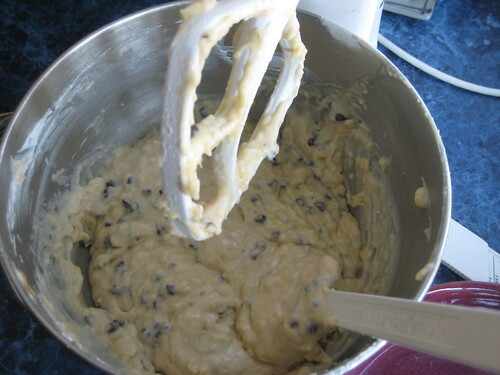 The batter looked like this when done. 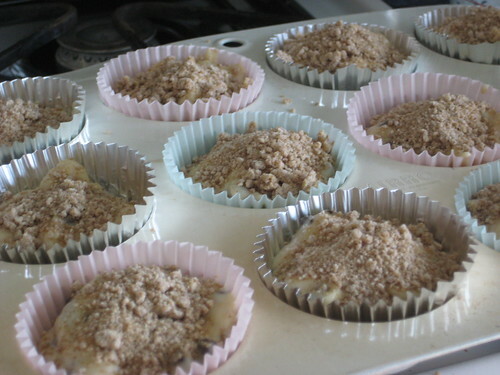 I took the crumb topping from this recipe for Banana Crumb Muffins. 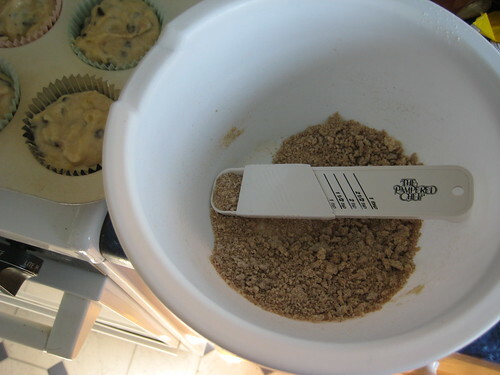 Mix together the brown sugar, the flour and cinnamon. Cut in butter until mixture is crumbly. Sprinkle topping on muffins. I put about one and a half teaspoons on each muffin. Bake 350* for 18-20 minutes. Allow to cool for about 15 minutes before removing paper liners. Delicious! This is now my favorite banana muffin recipe. After a day or two, the flavor is enhanced by warming them in the microwave for 15 seconds or so. This entry was written by ~~Rhonda, posted on February 25, 2009 at 11:19 am, filed under cooking, Recipes and tagged banana muffins, recipe. Bookmark the permalink. Follow any comments here with the RSS feed for this post. Post a comment or leave a trackback: Trackback URL.